All of the latest technology at all of the best prices, featuring Newegg deals on computers and parts, cameras, TVs, and everything electronic. Computers - Whether you're in store for a new laptop or desktop PC, a lightweight keyboard or another crucial component, this is your online computer superstore, featuring computers and accessories from all of the top tier brands and manufacturers. Browse the most popular desktop PCs for the office, portable laptops, netbooks and notebooks, Chromebooks, Ultrabooks, tablets, and all of the computer accessories you need to get and stay connected. Stock up on computer hardware and software, hard drives, computer monitors and cases, keyboards and mice, plus convenient all-in-one PC combos that come with everything you need to get all powered up. Electronics & TV's - Find the best Newegg deals on your next TV, with state-of-the-art HD televisions and Smart TVs, LED, LCD, Plasma and 3D televisions and accessories. Enjoy a movie theater experience with the best Blu-Ray players, audio speakers, and more home theater essentials. You'll also find portable electronics, from tablets and iPods to Mp3 players, radios and e-readers, plus GPS devices, car electronics, and more innovative electronic gadgets and gizmos for the new millennium. Cameras - Capture every memory and magical moment with the best digital cameras and camcorders from Nikon, Canon, Fuji, Olympus, Panasonic, and more of the most popular Point and Shoot and DSLR models on the market today. Explore the best deals on camera accessories, including lenses and flashes, memory cards, tripods, camera bags, cases, digital photo frames, and more photographic gear, only from the Newegg store. Gaming - Get your game on with the hottest video game consoles, from the PS3 to the Xbox 360, Nintendo Wii to the Nintendo 3DS, portable gaming systems, and more. Explore the Newegg deals for the most popular titles in video games for your consoles as well as PC and Mac games, plus a wide variety of money-saving bundled combos and accessories, including headsets and controllers, joysticks, racing wheels, cables, adapters and more extras that are exclusively for the gamer. 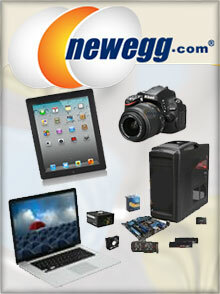 Since 2001, the Newegg store has served as the leading electronics focused e-retailer in the US, featuring exclusive deals on the latest consumer electronics and products ranging from computers and components to digital cameras, HDTV's to Mp3 players, and more. If it's electronic, they've got it.